It has been over two and a half years since you removed my son’s hemangioma and there is rarely a day that goes by that I don’t think about the great care you gave us and how you provided firm answers during a time when we were faced with nothing but questions. After our first visit with you when Evan was three months old, I walked away knowing we were in good hands. Three months later, I held my baby as he received his anesthesia and I clearly remember walking out of the operating room knowing I had found the best team in the world to care for him. I recently visited your Web site and I was once again astounded and grateful for the work that you do. You did such an amazing job removing Evan’s hemangioma and the scar he has is barely visible. You are all such wonderful people and making a difference in the lives of so many people. Thank you for all you are doing. I wanted to share some pictures of Evan with you-please feel free to use them in any way that can help other families or showcase your work. There is a picture of Evan at three months, pre-surgery at six months, immediately post surgery with Dr. Waner, two days post surgery and then today–Evan at three years old. Mindy Long, mother of Evan. 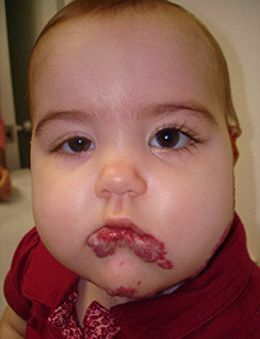 Before meeting Dr. Waner, we had to deal with conflicting information from physicians who had limited experience with extensive segmental hemangiomas. We sat by helplessly as Doctor’s scratched their heads at our daughter’s condition, and said over and over, “we’ve never seen anything quite like this”. Dr.Waner is so calm, encouraging, confident and experienced that after five minutes with him we had more hope and direction than all the months prior. When we visited Dr. Waner’s office as well as the surgical floor of the hospital in NYC, we felt like we were finally at the place where we could get the optimal care for our daughter. Dr. Waner deals with the most severe and complicated vascular malformation cases, and his experience alone is one of his greatest assets. He is so humble, caring and considerate of the plight of the children with whom he works and genuinely exhibits compassion for each and every one of his patients. We feel like he treats our daughter with such attentive and professional care that we never leave a meeting with him feeling unsure or worried. He has encouraged us throughout our daughter’s transformation that she would ultimately have the best outcomes possible. That has meant more to us than words could ever say. His approach to treatment is so effective that a patient who begins in his care, and then ends in it, comes out with minimal permanent damage both physically, emotionally and psychologically. I wish we could have come to him sooner than we did, then maybe our daughter would not have had her left facial nerve paralyzed with previous procedures. OOur greatest gratitude is that we got her to Dr. Waner when we did. He knew immediately upon meeting our daughter that she needed to have her facial paralysis addressed. He made arrangements for us to meet with one of New York City’s leading craniofacial specialists to discuss treatment options. This meeting was arranged on the same day that we first met with Dr. Waner, and we were so amazed that he had such close contacts to connect us to the help we needed instantly. 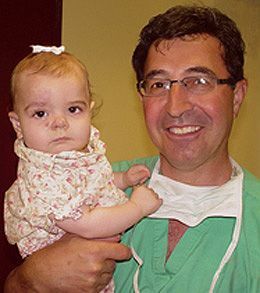 He is on the cutting edge of new and dynamic vascular malformation treatments, and has made this a life long commitment, and for that we are very grateful. When Rachel was born we noticed some bruise-like markings on her face, but we were primarily concerned about her ear – the top portion of her ear was nearly black in color and was very limp and flat. Little did we know what our journey was just beginning. From there, things went from bad to worse – the first doctor to address her “bruising” entered my room in the hospital and woke me from a nap with the words “Your daughter’s markings are not bruising. 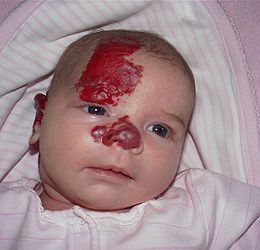 It is a port wine stain and based on the location she is going to have severe brain damage and must have a CT scan right away.” I was alone, had just given birth and I was terrified. Then, I had to call my husband on the phone and break his heart too. I immediately dismissed the doctor from my room and called the nursery for Rachel. I just wanted to hold her. As her mother, it is my job to protect her and keep her safe, and all my illusions about my power to do so were crushed. We were not event considering the social impact of her condition. 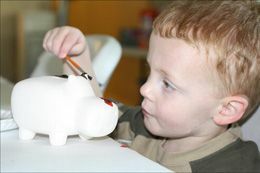 Then, at her two week check-up at the pediatrician I was approached by a young boy. He ran to me and said “Miss, miss, do you need help? 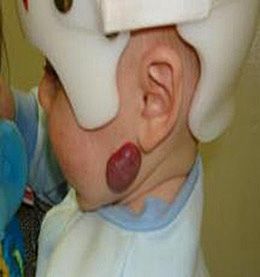 Is the baby bleeding?” He could see the hemangiomas from far away, and noticed I was crying and thought I needed help. He was not being hateful, but his statements were so hurtful. I could not believe that this is the way the world sees my beautiful new baby. Over the next three weeks, we were seen by three additional “specialists.” All of them said something different, only one actually came up with an accurate diagnoses, but was only interested in “managing Rachel’s pain” while we sit back and let the hemangiomas take over. We were not satisfied that any of the doctors really specialized in Rachel’s condition. And, when we asked for direction in obtaining second opinions, we were met with derogatory remarks and arrogance. I had been researching doctors on the internet when one of my friends from Little Rock, Arkansas called and said that I had to take her to New York to see Dr. Waner. I researched him on the internet and then called up to the practice. I figured that we would never get in to see him, but after a long chat with the LPN at the practice, she asked me to send photos and she would show them to Dr. Waner and see what he had to say. Within an hour she called me back and asked if we could be there in two days. So, we loaded up the family and headed to New York. We arrived at the clinic around 3 p.m. and I remember being terrified of all the other patients in the waiting room and the stories on the wall of success, but through so much treatment. Dr. Waner was able to see us at 5:30 in the afternoon – we were a work-in appointment, and I remember this so clearly. He touched her and examined her like none of the other doctors did. Then, he looked right at me and said “I can help her.” I could not believe it. Rachel was four weeks old and this is the first time we heard someone say this. Everyone else was preparing us for her future disfigurement and medical issues. Then he said “she is going to look normal” and I could not help myself – my response was “so what is your definition of normal.” Then, he left the room and called Dr. Francine Blei – a hematology expert at NYU and she agreed to open her practice an hour early to see Rachel. Who does this? The doctors from our home town only wanted to spend twenty minutes with us – Dr. Waner was with us for two hours – on a Friday evening. And I can remember having a notepad for questions – I did not want to forget anything and I also remember him saying “relax and slow down, I am not going to leave until you have all the answers you seek.” Again, who does that? From that point on, we had hope, resolve and relief. Suddenly, we went from feeling like we were on our own trying to figure out what kind of treatment Rachel needed, to having the very best care for her. Dr. Waner and his staff gave us their cell phone numbers and home numbers and when we called, they answered. I could not believe it. So, Rachel’s journey began a new chapter – that of healing. 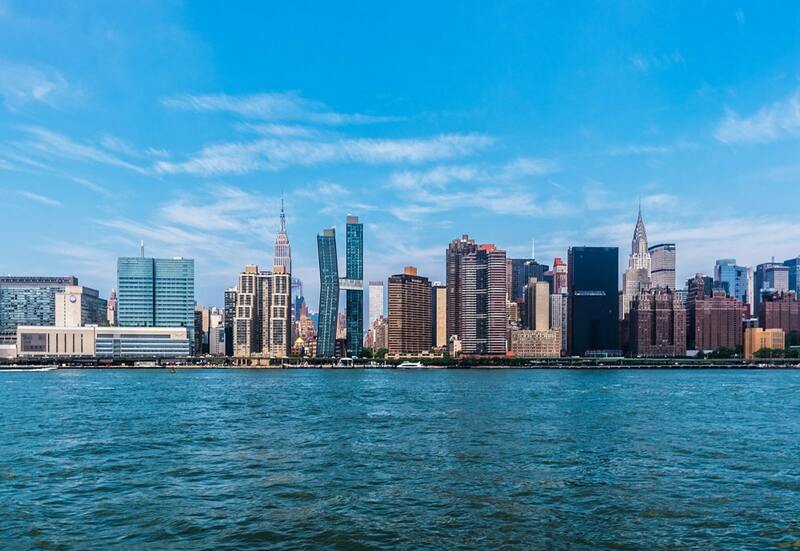 We traveled every other week to New York – one surgery a month and one clinic visit a month. The practice became family to us. The children in the waiting room were no longer frightening to us, they were a comfort. Some of the parents we met have become lifelong friends. Rachel progressed amazingly with the treatments. Then, when she was about six months old and she had truly turned a corner, I remember Dr. Waner walking me back from the waiting room to the recovery room after a procedure and he said to me “you know, your daughter was in a lot of trouble” and I wonder if he knew that I wasn’t afraid anymore. He chose that moment to share that with me because is was obvious that we could see what he saw in the waiting room on her first visit, that she could look normal. 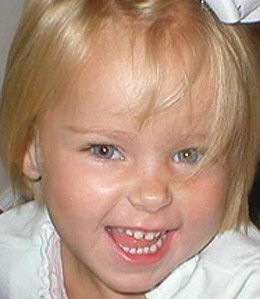 Rachel is now 3½ and enjoys a healthy happy childhood. No one points and stares at her and her medical condition is normal for a child her age. 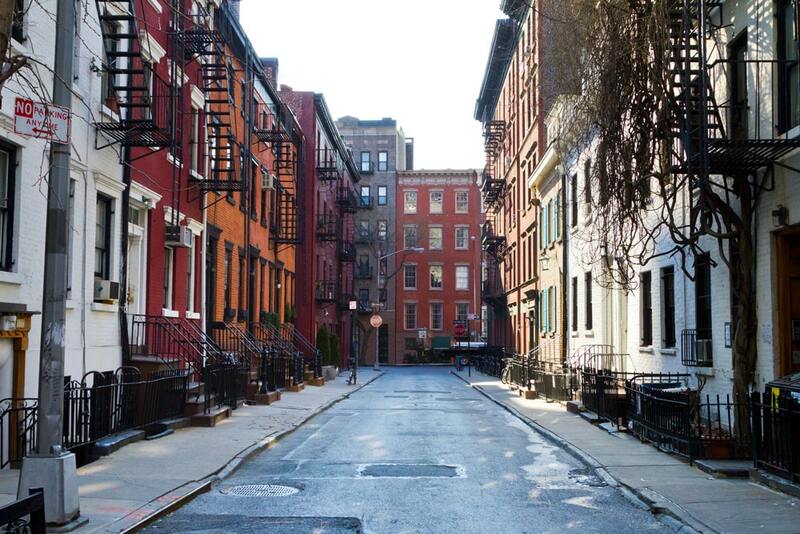 When I think of what could have been, if we listened – I just cannot imagine. This journey has changed us all, we look at life so differently. I have to say, I have never met a doctor so dedicated to his work, but so approachable and understanding of what it is to be a patient. I think that is what makes Dr. Waner so special. And for Rachel, we are certain she is destined for great things. Her courage inspires me. My beautiful Lilianna Carol, and her twin sister, Elizabeth Carson, came hollering into this world on October 7, 2004. They were born at 36 weeks and 4 days gestation but needed no extra care in the nursery. They were completely perfect and healthy in every way. Over the next 2 weeks Lili’s “stork bite” on her head began to get more red and raised. We also noted that she had another birthmark on her back, almost under her arm, that was quite large… Within a few days 4 more had made themselves known. For the first 2 months or so, Lili’s hemangioma on her head grew steadily. Her ped said that there was no way to tell how large it would get, but that it would eventually go away… He said that it would reduce in size by 10% for the next 10 years, and that I should not worry about it. I, however, was worried, and pushed him to send us to a specialist. We saw a pediatric dermatologist at Vanderbilt Medical Center. He said that Lili “might” be a candidate for surgery, but he wasn’t sure. He also mentioned steroids, but said that the side-effects / risks did not warrent using them in her case. Again we were told that it would eventually go away, and don’t worry about it. I, of course, had to worry about it. By this time (Christmas) the hemangioma on her head was very raised and “egg” shaped. People constantly asked me what happened to her head… I was so overwhelmed and sad for Lili. Here I was, a new mom with two beautiful babies, and all anyone notices is this “bump” on her head. Strangers actually gasped when they saw her. GASPED! 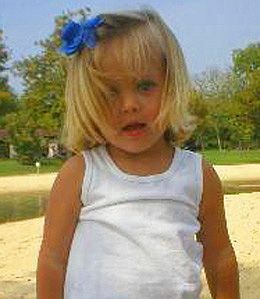 Additionally, the hemangioma under her arm had grown so quickly that it had ulcerated and was very sore. We could scarcely pick her up without her crying in pain. 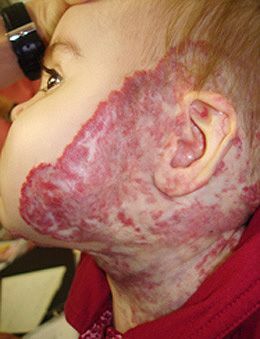 Again I took Lili to her pediatrician, and he said, “I’ve never known a hemangioma to be painful, so that is not why she is crying.” I knew better. I knew he was wrong. I knew she was hurting, and I knew that I was going to do something about it. I began to do research on my own, and after many hours of nothing, I found the VBF website. From there I soon found the MSN group – A group of amazing mothers that were so knowledgeable about hemangiomas and other vascular issues. I was immediately guided to get an opinion from Dr. Waner. Everyone spoke so highly of him, but I had no idea how this man would change our Lili’s life. Through a series of phone calls and emails, I was startlingly called by Dr. Waner himself. 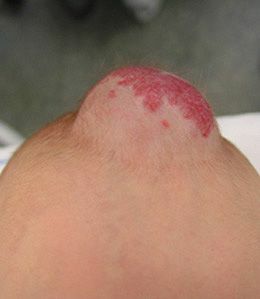 I had sent pictures and descriptions, and he wanted to discuss Lili’s hemangiomas with me. I was immediately calmed by his voice and confidence. I could tell that he was different. He was “getting” this. He could help. I will never, ever forget the words that he uttered to me during that conversation. “I can fix this. Don’t worry.” And for the first time in Lili’s short life, I began to not worry. We scheduled surgery in New York City for June 8, 2004. Upon arriving in the city, we went to our first pre-op appointment in the office. We were greeted by Janna, someone that had already grown near to my heart. She immediately took Lili, did not gasp in horror, but kissed her and held her and made her smile. Shortly after, Dr. Waner came into the exam room, and again, his demeanor put us at ease, and allowed us to trust him completely. He wanted Lili to have an MRI done by his people to determine the proximity of the hemangioma to the lining of her brain (Forgive me if this is not exactly correct!). He needed to know how much he could remove, and if he would have to leave some of the internal hemangioma there. We were set for the MRI early the next morning, and surgery would follow. I will always remember Janna and Dr. Waner coming to us after seeing the results of the MRI. He told me that there was no connection to her brain (lining? ), and that he could do this. Again, don’t worry. She was going to be great. 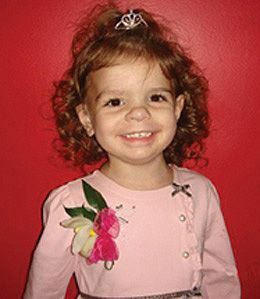 The surgery took longer than expected – Excisions were perfomed on 3 of her hemangiomas, and one more was lasered. When I saw Lili in the recovery room, the very first thing I noticed was that she looked just like her twin sister. I was amazed at how her appearance had changed. And I was anticipating how her life would now change. That day was the first day of “normalcy” for our Lilianna Carol. Dr. Waner gave her that gift. She was never again gasped at, or the receiver of a look of horror or pity. People responded to her in a different way now. And for that I will be forever grateful. There are no words to express how I feel about Dr. Waner. None. There is not a word bigger than gratitude, deeper than appreciation, that can even begin to say, “Thank you.” He is a man with a vision, and he has surrounded himself with like-minded people. He told me, “I can do this.” and he did. We are grateful that parents have sent photos of their children, and have shared their experiences with us. A wonderful video testimonial from a patient’s Grandma!